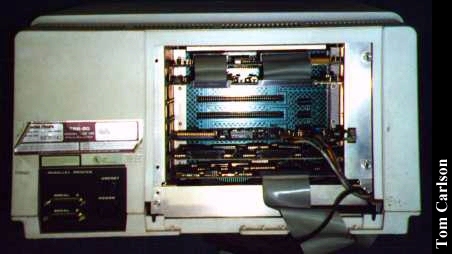 The Tandy 16b, and the similar Tandy 6000, were Tandy's stab at a multi-user business system. These machines came equiped with both a Motorola 68000 and a Zilog Z-80. 64Kb of RAM was standard, but could be expanded up to a whole megabyte. You had a wide range of operating systems from which to choose. Using the Z-80 chip, these systems could run good old CP/M. Being Tandy's, they could also run LDOS. 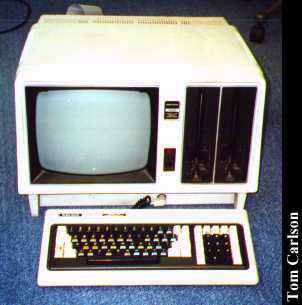 Utilizing the 68000 chip, they could also run Xenix, Microsoft's early UNIX experiment, that later morphed into SCO UNIX. Under Xenix, the 16b/6000 could handle two stand-alone terminals in addition to the base unit itself. 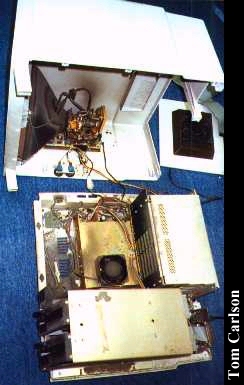 The 16b came standard with two 8" 1.2 meg floppy drives. 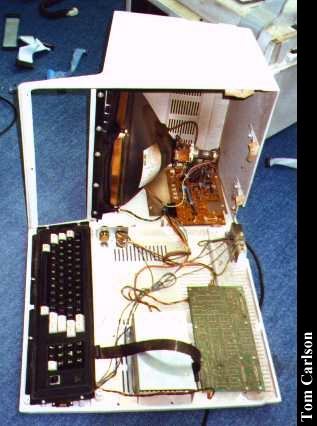 The 6000 could also be equipped with one floppy and an internal 15 meg hard drive. A green monochrome screen was also standard. 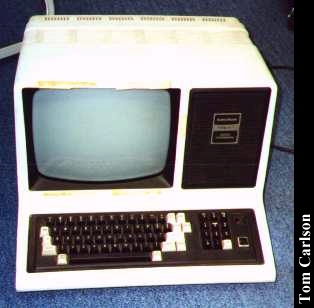 The usual terminal was the DT-1, a dumb terminal housed in a TRS-80 Model 3 shell. Unfortunately, none of these actual pieces of hardware that I have sitting here actually work. I cleaned them up, cleaned and rechecked connections, and so on, but was unable to get them to boot up at all. So I tossed them, but not before taking some pictures. Tandy 16b Back The top card is a memory card. The one right below contains the 68000. The Z-80 is on a large motherboard sitting underneath this card cage. Click here to view all comments for the Tandy 16b and to leave your own. 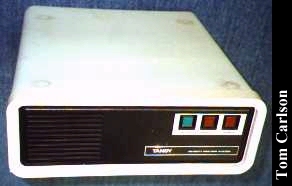 Click here to view comments about other Tandy computers.